witnessed a violent death, or have been called upon to serve as witness to a judicial execution. The U.S. is one of the few free societies, along with Japan and South Korea, which still administers the Death Penalty to the worst of offenders. This said, our American method of Execution is sterile and detached, almost seeming like a medical procedure rather than an administration of death. Those carrying out the execution have been medically trained and the act takes place in a room resembling an operating theater. Executions are carried out behind prison walls and witnessed by just a handful of individuals. Every effort is made on the part of the state to carry out the procedure in a way that is quick, humane, and sparing the condemned from any unnecessary suffering. Compared to other nation's who've retained capital punishment, these executions are relatively rare and get scant coverage. This was hardly the case with the execution of the Christ. Rome ruled with an iron fist and without pity, and her execution of justice was intentionally brutal. The Roman crucifixion epitomized this fact. 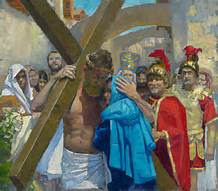 Those unfortunates who experienced crucifixion died in the most prolonged, miserable way imaginable. They would, over a period of hours to days, succumb to dehydration, physical exhaustion, and ultimately die by suffocation as breathing became ever more difficult. Though this execution process could last days in the case of the strongest victims, the process could be artificially accelerated by the Roman's in order to satisfy the desire of the Jewish religious establishment who wanted the executions completed prior to sundown and the start of the Passover feast. When comparing the most barbaric executions in our modern world to the death of Jesus, they would even be seen as relatively humane. The execution of Jesus was slow, excruciating, and inhumane in the most extreme ways imaginable. Jesus knew exactly what he'd be experiencing and I think that why he asked the Father if there was another way. He was not merely going to die this afternoon. He would be first offered up as a propitiation, poured out as the only offering fit to satisfy the justice and righteous wrath of the Almighty. The weight of sin's debt demanded nothing less. It was only upon it's satisfaction could Jesus cry out "TETELESTAI! ", bow his head, and release his live to the Father.